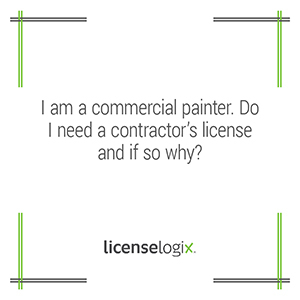 Do I need a commercial painters contractor’s license and if so why? In many states what constitutes a contractor is broadly defined to include any person who undertakes to construct, alter, repair, improve, or demolish any building, road, or other improvement. In many states you will be required to take an examination to be a licensed general contractor. Construction licenses are required because licensing laws protect the public from incompetence and dishonesty in those who provide construction services. The requirements also provide minimal assurance that all persons offering such services have the required skill and character, understand local laws and codes, and know the basics of a contracting business. Because of the strength of this public policy, the laws apply regardless of injustice to the unlicensed contractor. The remedial purpose of the law is designed to protect the public regardless of the equities involved. The licensing statutes represent a legislative determination that the importance of deterring unlicensed contracting outweighs any harsh results. Thus, even a small lapse in licensure during construction may prevent recovery of all compensation due the contractor, not just a portion of it. For additional help you can click contact us, or give us a call at (800) 292-0909.